Very interesting would look great with subtle blue accented gear and what bang for buck let just hope it stands the test of time. The blue LEDs are just a little too light - though I'm sure that wouldn't be too hard to amend with a bit of masking. 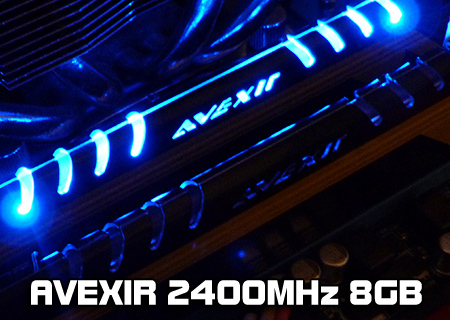 That's so funny, I was just looking at the Avexir memory kits last night and wondering just how good they were. They also make the LED effect in red, green, white, orange, and yellow, and have interchangeable heatspreader designs that you can order for them (the red version of the MPOWER design they showcase here, and a plain gunmetal black version). Should you choose to do so you can individually select all of these items to customize the memory yourself through their website... they even go so far as to allow you to customize what the PART NUMBER reads in something like CPU-Z, and you can get something etched onto the heat spreader. I would imagine that this all costs a pretty penny however, as this is all done DIRECT through Avexir and shipped DIRECT from Avexir... WERTH IT!